Click on the photos for detailed descriptions and larger pictures! We fell in love with the Parrot and then saw some of the other critters! They're just too cute and we had to add them to our collections. 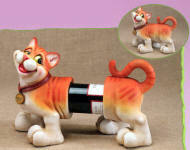 Well, friends saw them and suggested that we sell them as well .... so now we have an entire selection of Wine Bottle holders and also some bottle neck climbers (which have also been discontinued by the manufacturer, so get them while we have them available). These collectibles look great anywhere in your house and add a bit of whimsy to any decor ... can't help but put a smile on your face! The coordinating, versatile, whimsical coasters, corkscrew/eyeglass holders and bottle openers have arrived ... be sure to check them out!